All things bubbly/sparkling provided by Palm Bay Imports! I hope 2018 is treating you well, I will be back soon with an inspirational post and to share my "word/phrase" for this new year, the theme is actually a personal one that will cross over into the blog as I will post monthly to hold myself accountable for truly living my word this year, don't tell me yours yet, we will share them together on an upcoming post (more than likely on Monday for "Motivation Monday" on the interwebs). They were nice enough to hook me up on New Year's Eve, I usually share a shot on social media with a picture of what I am sipping leading up to midnight, but this year things were pretty festive so I thought I would share my sparkling sips with you in a full blog post. Bottega Gold - Prosecco Doc Brut Sparkling Wine, Glera Grapes grown close to the Venetian Prealps. Stainless Steel containers at low temps to preserve freshness and the golden bottle also protects the wine from any source of light helping to also preserve aroma and freshness. Alcohol Content: 11% - and it just plain looks cool on your bar! Above: SWEET DECISIONS! 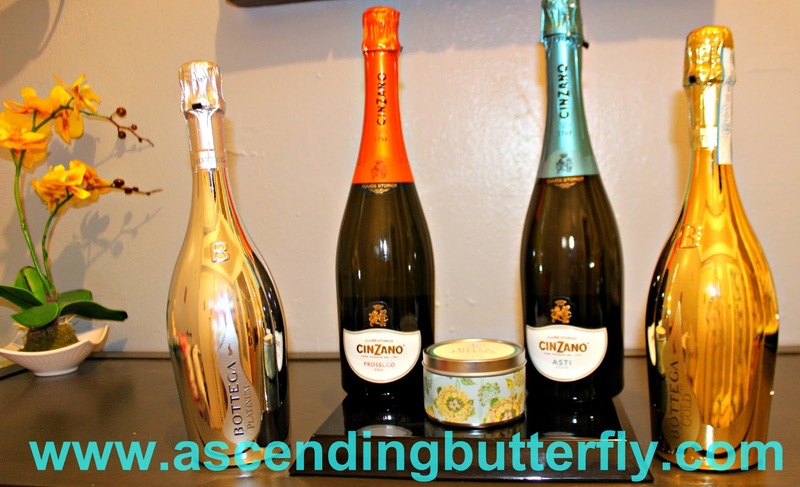 From Left to Right: Bottega Platinum, Sparkling Moscato, Cinzano Cuvee Storica Prosecco, Dry Sparkling Wine, Cinzano Asti D.O.C.G. 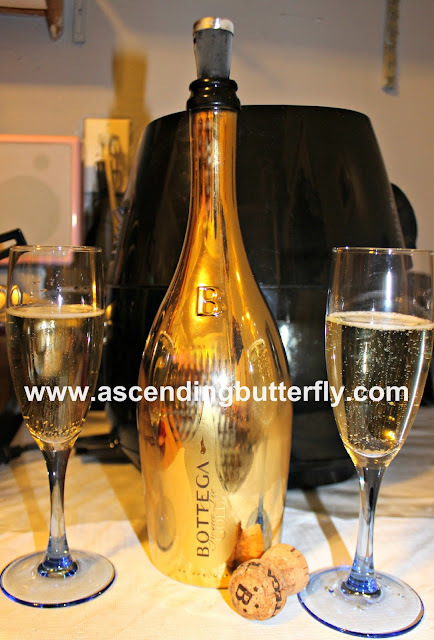 Sparkling Sweet Wine and Far Right: is the Bottega Gold Prosecco. Also featured in the close up photo above with the two glasses. 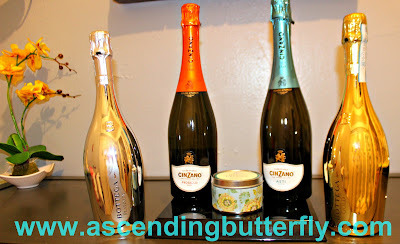 I already raved about Cinzano Prosecco when I got to try it at the BabbleBox Holiday Party in NYC, it tastes amazing and won't break the bank, and is really well balanced, not sweet yet not overly dry. Bottega Prosecco is just slightly sweeter than Cinzano but also very well balanced and the bottles are such a beautiful presentation in addition to blocking light to preserve freshness. 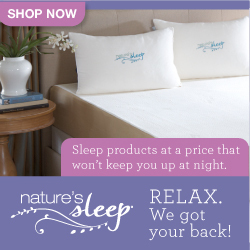 Quite frankly any of these would make lovely hostess gifts! And I have no idea where I have been, but this was my first time trying a sparkling moscato! YES to that! Yes to all things sparkling and bubbly! I had a lovely start to my new year and hope you all did too! Butterflies What Did you do for New Year's Eve? Did you got out or stay in? What were you drinking? FTC Disclosure: Wine provided for Editorial Consideration, all opinions are 100% my own! I am disclosing this in accordance with the Federal Trade Commission 16 CFR, Part 255 - Guides Concerning the use of endorsements and testimonials in advertising, you may check our Giveaway & Disclosure Page for additional information regarding Ascending Butterfly Disclosure. Things that lure this butterfly out of her cocoon: Technology, Travel, Fashion, Beauty, Spirits (Sparkling, Champagne, Prosecco, Sake, Bourbon, Craft Brews), Foodie Fun - really I'm such a *simple girl*. This is my favorite drink! I drink it as is and also have a bunch of recipes. LOVE! @Rachel I need to check out some of those recipes so I can mix things up a bit! Happy New Year. I had a quiet one at home with the family. dropping by from WW. Happy New Year Suzy, I usually spend it with family and we alternate hosting, it was my year this year, glad to have been able to stay home and have everyone come to me this time around!